• 3,500 sq. ft., 3 bath, 3 bdrm single story - $2,100.00 USD Monthly - Built for entertaining! 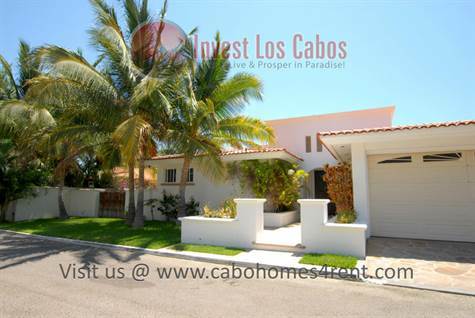 La Jolla, San Jose del Cabo - Perched on the mountainside of the San Jose corridor sits the gated community La Jolla. With its dramatic views of the tranquil Sea of Cortez and Palmilla Point, this peaceful community is the perfect place to call your new home in paradise! This luxurious one level villa is situated towards the end of a quiet cul-de-sac, enshrouded in lush palms which disguise the home's expansive offerings. Boasting 3 palatial bedrooms, two of which are master suites with charming old world finishes, this villa offers light, space and most importantly, spectacular views of the Sea of Cortez! Enter to a bright, skylit entrance foyer which leads down to the open-floorplan great room offering graceful archways, vaulted ceilings, open kitchen complete with dining bar, and a wall of windows granting you breathtaking blue views. Generous outdoor areas offer a private pool w/ waterfall jacuzzi, covered outdoor dining area, manicured & lushly landscaped side yard, and plenty of space to entertain. Enjoy the outdoor living that Los Cabos is famous for! This home will be turned over with basic furnishings (beds, sofa, dining table), allowing you to bring in your own furniture pieces to add that "personal touch" , making this villa truly your own! Available immediately on a 6-12 mth contract. Pets okay. 1mth damage dep. due @ signing, 1st mth rent & pagare due @ occupancy. Rent includes HOA dues. Tenant responsible for all utilities, gardener and weekly pool maintenance.